Precise oxidative protein folding in the endoplasmic reticulum (ER) is essential for normal cell and tissue function, whereas perturbations of this process culminate in a state known as ER stress. Sustained ER stress has been linked to several pathological conditions like diabetes, atherosclerosis, cancer, myocardial infarction and neurodegenerative diseases, such as amyotrophic lateral sclerosis, Alzheimers, Parkinsons and Huntingtons disease. The majority of pathways responsible for proper protein folding and surveillance are well characterized; yet the role of glutathione and glutathione peroxidases in this process has remained largely unexplored. 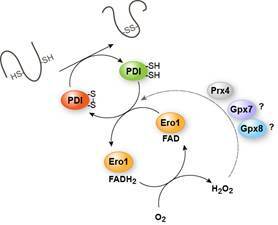 It is assumed that glutathione and glutathione peroxidases enable oxidative steps during thiol/disulfide exchange reactions by providing oxidizing equivalents directly to its substrates or via thiol/disulfide exchange reactions involving protein disulfide isomerases. Furthermore, they may additionally function as putative ER oxidative stress sensors. Previous work from our laboratory showed that glutathione peroxidase (Gpx) 4, one out of eight glutathione peroxidases in mammals, harbors protein thiol peroxidase activity in vivo by introducing disulfide bridges into proteins besides its classical glutathione peroxidase function. While Gpx4 is expressed in the cytosol, nucleus and mitochondria in somatic cells, it does not localize to the ER where it is replaced by its recently recognized monomeric cysteine-containing homologues, Gpx7 and Gpx8. Therefore, newly established conditional knockout mice and cells for Gpx7 and Gpx8 will be unique tools to study the role of glutathione peroxidase members in oxidative protein folding and to further investigate their function in vivo as ER redox sensors. 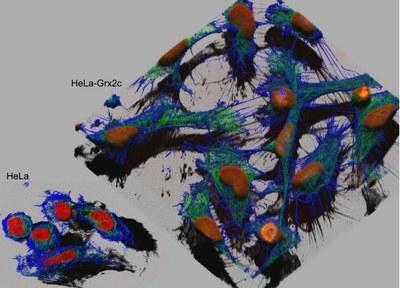 Thus, the key objectives of this proposal are to (i) examine the in vivo expression patterns of Gpx7 and Gpx8, (ii) to analyze the impact of neuron-specific disruption of both enzymes in vivo, (iii) to examine the mechanisms of wild type Gpx7 and Gpx8 and their respective mutants on a cellular and biochemical level in oxidative protein folding, and finally (iv) to address the cross-talk between ER stress, unfolded protein response and cell death signaling in Gpx7 and Gpx8 knockout models. Conclusively, studies proposed herein will shed new light on the in vivo relevance of oxidative protein folding as well as the molecular mechanism by which Gpx7 and Gpx8 confer their redox sensing function. Identification of downstream effectors of Gpx7 and Gpx8 may unmask ER relevant physiological thiol switch mechanisms, ultimately leading to new concepts in pathological conditions with an ER stress signature. Targeting spectrin redox switches to regulate mechanoproperties of red blood cells. The mechanical properties of red blood cells (RBCs) are fundamental for physiology. To transport oxygen, RBCs need to survive the hemodynamic changes in the vascular tree, dynamically contribute to the flow to decrease vascular resistance, and deform during the passage through narrower vessels. RBC mechanoproperties are conferred mainly by the structural characteristics of their cytoskeleton, which mainly consists of a spectrin scaffold connected to nodes of ankyrin and alpha-tubulin. Changes in redox state and treatment with thiol-targeting molecules decrease deformability of RBCs, and affect the structure/stability of the spectrin cytoskeleton. However, structural characteristics, molecular localization of redox switches and their functional link to RBC mechanoproperties, blood viscosity and tissue perfusion are unknown. We hypothesize that cysteine redox switches (CRS) on the spectrin cytoskeleton are targeted by redox signaling in RBCs and modulate RBC mechanical properties, thus, contributing to the modulation of blood viscosity, blood flow, and tissue perfusion. Hence, the aim of this project is to (1.) to identify, experimentally validate and analyze the effects of putative CRS in erythrocytic spectrin; (2.) to analyze the effects of CRS modification on RBC mechanical properties; (3.) to investigate the functional significance of spectrin CRS in the physiology of RBCs in vivo. First, by integrative modeling, we will generate a structural model of spectrin at the atomistic level, which will allow us to identify and localize putative CRS in spectrin and to investigate how their chemical modification impacts elastic properties of spectrin. In conjunction, the impact of CSR modifications on structure/functional characteristics of spectrin in cells, including stability, mechanical properties, and protein/protein interactions with other cytoskeletal proteins will be experimentally analyzed. Second, RBC will be treated with physiological stimuli inducing intracellular production of reactive species (i.e., NO, O2-/H2O2, sulfide/persulfide/polysulfide) under normoxia and hypoxia, or changes in the cellular redox state. We will then analyze spectrin CSR modification, and their effects on RBC morphology and RBC mechanical properties, including RBC deformability, osmotic stability, and blood viscosity. Third, we will analyze the effects of (1.) pharmacological application of NO or sulfide, (2.) changes in redox state by phenylhydrazine, or (3.) genetic modulation of endogenous NO synthesis in RBC in mice on spectrin CRS modification, and their effects on RBC functional properties, gas exchange, and tissue perfusion. Structural and functional characterization of putative spectrin CRS will allow to shed light on the role of redox regulation on RBC mechanical properties, and may provide novel functional targets to modulate RBC function, blood flow, and tissue perfusion. Several thiol switch candidates have been identified and characterized during the 1st funding period of the SPP 1710. Such characterizations are often based on redox mobility shift assays and protein-protein interaction studies. Quantitative kinetic and detailed mechanistic data on potential as well as established switches are usually difficult to obtain using such methods. Hence, the underlying rate constants for toggling thiol switches and the physiological relevance of detected redox species often remain unclear. During the 2nd funding period of the SPP 1710, we will focus on the quantitative and mechanistic assessment of (candidate) thiol switches by stopped-flow kinetic measurements. We will therefore complement the portfolio of existing key methods within the priority programme by establishing a stopped-flow platform. This platform will be accessible to all SPP members who are interested in the determination of rate constants for (candidate) thiol switches and the elucidation of mechanisms for thiol switching and roGFP2-based redox sensing. For example, we will assess the reactivity of the cysteine residues of the Keap1-like artemisinin-resistance factor PfK13 from the malaria parasite Plasmodium falciparum and characterize the regulatory role of residues C143 & L109 for the Prx5-type model peroxiredoxin PfAOP. Other peroxiredoxins as well as glutaredoxins, roGFP2 probes and flavoenzymes will be studied in the frame of collaborations with SPP 1710 members. Findings from this project will improve our basic knowledge on thiol switches and redox probes and might also help to better understand redox signaling and artemisinin resistance of malaria parasites. The NADPH-dependent thioredoxin reductase C (NTRC), thioredoxin and related proteins are involved in thiol/disulfide exchange reactions affecting many key enzymes in central metabolic pathways of photosynthetic organisms. This posttranslational control applies also to tetrapyrrole biosynthesis to fine-tune enzyme activities in response to environmental and endogenous cues and to prevent accumulation of photoreactive tetrapyrrole metabolites. In previous studies several proteins of the tetrapyrrole biosynthetic pathway have been identified to interact with these thiol-reductants. In my group, studies on posttranslational control of tetrapyrrole biosynthesis have been already performed and confirm the regulatory impact of thiol-disulfide exchanges between thioredoxin and NTRC and two proteins, the CHLI subunit of the Mg chelatase (MgCh) complex and the MgProto methyltransferase (CHLM), respectively (Luo et al. 2012, Richter et al. 2013). Reduced content of glutamyl-tRNA reductase (GluTR), CHLM and protochlorophyllide oxidoreductase (POR) has been found in a pale-green Arabidopsis ntrc mutant (Richter et al., 2003) indicating that NTRC is essential for stability and/or activity of enzymes in tetrapyrrole biosynthesis and likely a central redox regulator of tetrapyrrole biosynthesis. The main objective of the proposed project is to identify and validate the thiol-based redox switches of the three enzymes of the tetrapyrrole biosynthetic pathway, CHLM, GluTR and POR, which are catalyzed by NTRC, and to elucidate the physiological effects of the posttranslational modifications of these NTRC target enzymes as well as, in consequence, the balanced supply of the end-products, chlorophyll and heme, in the balanced quantities. After confirmation of NTRC interactions with tetrapyrrole biosynthesis enzymes by alternative biochemical methods, it is intended (i) to examine the redox-active thiol switches that control the activity and stability of these enzymes and (ii) to analyze in planta the modulated enzyme activity of Cys>Ser substitution mutants of these enzymes in comparison to wild type always in an Arabidopsis knock-out mutant background for the respective analyzed enzyme. It is expected that elucidation of details of the thiol-disulfide exchange reactions on enzymes of tetrapyrrole biosynthesis will improve understanding on redox-controlled tetrapyrrole biosynthesis, which includes changes of enzyme activities, protein structure and stability as well as interaction of proteins to others components of the pathway and their localization within the chloroplast. Calcium entry through ion channels plays an important role for a variety of cellular functions such as proliferation, contraction, exocytosis or gene expression. In many electrically non-excitable cells store-operated calcium release-activated calcium (CRAC) channels are a major calcium entry source. Two STIM and three ORAI proteins form CRAC channels with STIM1-gated ORAI1 channels being the most relevant STIM/ORAI combination in the cell types analyzed so far. We have recently shown that calcium entry through CRAC channels is also a major calcium entry mechanism in human melanocytes and melanoma cells. As in other cell types, ORAI1 channels are the main molecular players and they control endothelin-1-induced mitogenesis and melanogenesis. Surprisingly however, STIM2 expression was found to be higher than that of STIM1 and STIM2-gated ORAI1 channels carry the major proportion of calcium entry. 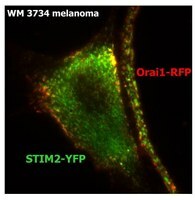 Unpublished data furthermore show that STIM2 is very important for melanoma growth and invasion. Interestingly, STIM2 reciprocally regulates growth and invasion: Higher STIM2 activity correlates with increased migratory and invasive potential of melanoma cells, while lower activity favors melanoma cell proliferation. Phenotype switching between proliferation and metastasis is indeed an important general principle in melanoma research. The mechanisms that control this phenotypic switch are, however, largely unknown but most likely involve extracellular signals from the tumor microenvironment and complex intracellular signal transduction. Since STIM2 has many more cysteines than STIM1 and STIM1 was already shown to be redox sensitive, it is reasonable to assume that STIM2 function is regulated by thiol-based redox processes. To test this hypothesis, we have analyzed STIM2 cysteine oxidation and found that STIM2 contains reactive cysteines, which can be reversibly oxidized and thus have the potential to act as thiol switches. The reactive cysteines are functionally relevant since their oxidation drastically reduced calcium entry in human melanoma cells. We therefore hypothesize that thiol-oxidation of STIM2 could act as a redox switch to modulate the melanoma phenotype. To identify the respective cysteines in STIM2, characterize the thiol chemistry and to test their functional importance are important goals of this grant. Specifically we define the following aims: 1) Screen and define redox chemistry of STIM2 cysteins to identify thiol switches. 2) Characterize the effects of STIM2 cystein modifications on ORAI1 interaction and calcium signaling in melanocytes and melanoma cells. 3) In vitro and in vivo analyses of the functional relevance of STIM2 thiol switches in melanocytes and melanoma. 4) Determine sources, localization and dynamics of physiologically relevant oxidant production in the skin. Iron-sulfur (Fe/S) proteins are located in mitochondria, cytosol and nucleus, and fulfill essential tasks in metabolism, respiration, protein translation, and DNA synthesis and repair. Their Fe/S clusters are assembled and inserted into apoproteins by complex machinery in both mitochondria and cytosol. The cytosolic Fe/S protein assembly (CIA) machinery comprises eight known proteins which assist the maturation process in two major steps. First, a [4Fe-4S] cluster is synthesized on a scaffold complex (Cfd1-Nbp35) which requires mitochondria as a sulfur donor and an electron transfer chain for reduction. The cluster is then transferred to Fe/S apoproteins by the CIA targeting complex in a target-specific manner. A component of this complex, Cia2, contains one of the most reactive thiol groups of eukaryotic cells. This Cys residue (in yeast Cys161) is indispensable for cell viability, yet its molecular function is unknown. Human cells contain two Cia2 isoforms which drastically differ in their target protein specificity. CIA2B is the ortholog of yeast Cia2, and is involved in the maturation of the majority of cytosolic and nuclear Fe/S proteins. In contrast, CIA2A shows strict target specificity for iron regulatory protein 1. Thus, the CIA2 target specificity separates the processes of generic Fe/S protein assembly and cellular iron regulation in human cells. The central goal of this project is to elucidate the role of yeast and human Cia2 proteins in Fe/S protein assembly with particular emphasis on the molecular function of the hyper-reactive Cys161 residue. We will investigate how the thiol reactivity of Cys161 changes under different physiological conditions and upon depletion of other CIA components. We will identify compounds transiently binding to the thiol moiety in order to define its precise role in Fe/S cluster transfer and/or insertion into target apoproteins. For a better molecular understanding of Cia2 function, protein interaction analyses and ultrastructural NMR and X-ray studies will be performed with complexes of Cia2 and its partner CIA proteins or its target Fe/S apoproteins. These structural insights will provide the molecular basis for the characterization of the high substrate specificity of human CIA2A and CIA2B, and for the understanding of the role of the hyper-reactive thiol. Overall, our studies will contribute to a better molecular understanding of the mechanistic contribution of one of the most reactive cellular thiols in two essential biological pathways, Fe/S protein biogenesis and iron regulation. Redox modifications of protein cysteinyl residues - protein thiol switches - specifically and reversibly switch proteins between different conformational and functional states and thereby control numerous cellular functions. We have previously shown that a cytosolic isoform of the vertebrate-specific oxidoreductase glutaredoxin 2 (Grx2c) is essential for brain development. We have identified CRMP2, a mediator of semaphorin/plexin signaling, as redox-regulated target and demonstrated that this regulation is required for normal axonal outgrowth and brain development. Our preliminary results demonstrate that the CRMP2 redox switch does not only control neuronal development, but also cell migration, invasion and cytoskeletal dynamics in general. We demonstrate a specific and reversible intermolecular Cys504-Cys504 thiol-disulfide switch in homo-tetrameric CRMP2. This switch determines two conformations of the quaternary CRMP2 complex. Our work in progress provides also evidence that the semaphorin/plexin-activated flavin monooxygenases of the MICAL family could be responsible for oxidation of CRMP2 thiols, while Grx2c catalyzes the reduction. We therefore propose one of the first thiol-disulfide switches operated by a specific oxidase and a specific reductase, comparable to kinase/phosphatase pairs controlling protein functions. Within the strong network that will be provided by the Priority Program 1710, we aim at clarifying the molecular mechanism of this redox switch. More specifically, we will clarify whether MICAL proteins operate the CRMP2 thiol-disulfide switch as specific oxidases (task 1) and if this occours in response to semaphorin signaling (task 2). We shall clarify the molecular mechanism of CRMP2 oxidation (task 3). We will identify the molecular basis of the thiol disulfide switch and how this affects the interaction of CRMP2 with downstream effectors (task 4). We propose to investigate the intersection of this thiol-disulfide switch with phosphorylation signaling cascades in the regulation of cytoskeletal dynamics using quantitative proteomic approaches (task 5). And, we will investigate the role of the regulatory iron-sulfur cluster in Grx2 in the regulation of CRMP2 activity and cytoskeletal dynamics (task 6). Our project aims at deciphering the precise biochemical mechanism of this thiol-disulfide switch, how it is specifically operated in vivo, and how this affects the protein's function and interaction with other proteins and signaling pathways, i.e. its physiological role. Beside their classical function in facilitating protein folding in the endoplasmic reticulum (ER) protein-disulfide isomerases (PDIs) act at the cell surface; thereby regulating various biological processes, like cell-cell adhesion or enzymatic activity. One prominent substrate of the PDI is the transmembrane metalloprotease A Disintegrin And Metalloprotease-17 (ADAM17). Besides its essential role in development, ADAM17 is involved in regeneration processes and immune defense in the adult organism. Hence, an uncontrolled enzymatic activity of the protease is associated with pathophysiological situations, like tumor progression and chronic inflammation, e.g. by the release of growth-factors and pro-inflammatory cytokines from the cell surface. Consequently, the enzymatic activity of ADAM17 has to be tightly regulated. PDI oxidoreductases act as an off-switch of active ADAM17. The detailed consequence of the PDI action on ADAM17 is described at a structural level. A drastic change within the membrane-proximal domain (MPD) of ADAM17 due to a specific disulfide-bond isomerization abrogates ADAM17 activity. However, nothing is known about the regulatory mechanisms underlying this important thiol switch. This application aims to analyze how PDI traffics to cell compartments beyond the ER and where PDI interacts with ADAM17. Furthermore, we will search for an enzyme with opposite activity of PDI, which mediates an on-switch of ADAM17, allowing a rapid modulation of its enzymatic activity. Therefore, immunohistochemistry-, bimolecular fluorescence complementation- and mass-spectrometry based methods will be applied. Thereby, the focus will lie specifically on cell-surface localized PDI. We will identify interaction partners which allow PDI to leave the ER, to travel to the plasma membrane and to interact with specific substrates. The trafficking of PDI as well as the influence of interacting partners in this precise off-switch will be functionally analyzed and characterized. Reactive oxygen species (ROS) are involved in many fundamental cellular processes ranging from host defense to signaling. When produced uncontrolled, however, ROS-mediated damage can contribute to serious human diseases. These diseases are often connected to the dysfunction of the molecular chaperone network, which maintains the cellular proteostasis. We have now evidence that Get3, a highly conserved protein best known for its ATP-dependent role in the post-translational membrane insertion of tail-anchored membrane proteins, functions as an ATP-independent general chaperone under ATP-depleted oxidative stress conditions. Our mechanistic and structural studies on Get3 redox-regulated chaperone function will address fundamental questions in regards to redox biology and chaperone action in eukaryotes. Our investigations will help us to understand how Get3 and possibly other redox-regulated proteins undergo thiol-based redox switches to facilitate the crucial conformational changes that modulate their activity. Analysis of the potential interaction of Get3 with other chaperones like Hsp70/40 will enhance our understanding of complex chaperone networks in eukaryotes whereas analysis of the fate of Get3 substrate proteins upon their release from Get3 will shape our ideas of how organisms recover from oxidative stress-induced protein damage. This work will facilitate our understanding of how quality control in eukaryotes is influenced by oxidative stress and has the clear potential to uncover a new chaperone network paradigm, in which specified proteins moonlight as molecular chaperones under specific stress conditions. Redox biochemistry is increasingly recognized as a crucial component of cellular signal processing in all types of organisms. Endogenous changes of oxidant levels are now known to contribute to cell fate decisions, such as proliferation, differentiation and apoptosis. Keeping the balance between damaging and adaptive processes mediated by oxidant levels is key to adaptation of life forms to changing biotic and abiotic environments, both throughout the life cycle of one organism and also on a larger scale during the evolution of organisms. Plants are sessile organisms and, in contrast to mobile animals, have to adjust to their environment being faced with challenges such as damage by pathogen attack or stress exposure by UV-light and draught. All plants possess CPYC and CGFS glutaredoxine (GRXs), glutathione-dependent oxidoreductase proteins, which are members the thioredoxin-fold superfamily. Like thioredoxins, GRXs act as antioxidants and have cysteine thiol disulphide exchange catalytic properties. At the time when plants conquered the land, about 500 MY ago, in the most basal land plants, the mosses, a novel land plant-specific GRX group, the CC-type GRXs, emerged. During the evolution of land plants, exclusively this CC-type GRX group expanded strongly coinciding with the formation of plants, which are composed of more complex organs and better adapted to a life on land. This raises the intriguing questions about the biochemistry of novel evolving redox signaling events and thiol switches and their specific functions during the evolution of land plants. The proposed SSP project focuses on investigating the function of the land plant-specific CC-type GRXs, ROXYs, and the underlying protein thiol switches during land-plant evolution. ROXY1 from Arabidopsis thaliana governs petal and anther development via interaction with the TGA transcription factor PERIANTHIA (PAN) in the nucleus. Given that ROXYs are land-plant specific, we aim to unravel the molecular function of ancestral ROXYs in a basal land plant, the livermoss Marchanita polymorpha, to understand how a land-plant specific group of GRXs and the associated thiol-switches and redox-processes have contributed to novel adaptations to a life on land. Towards this goal, the biochemical activities of ROXYs and TGAs from Arabidopsis (ROXY1, PAN) and Marchantia (MpROXY1/2, MpTGA1/2) will be compared. By a combination of in vitro and in vivo approaches we aim to determine which ROXY-mediated redox-switches are specific and which ones are conserved among land plants as well as understanding their in vivo function by comparing phenotypes and physiology of transgenic plants where the ROXY activity has been modulated.